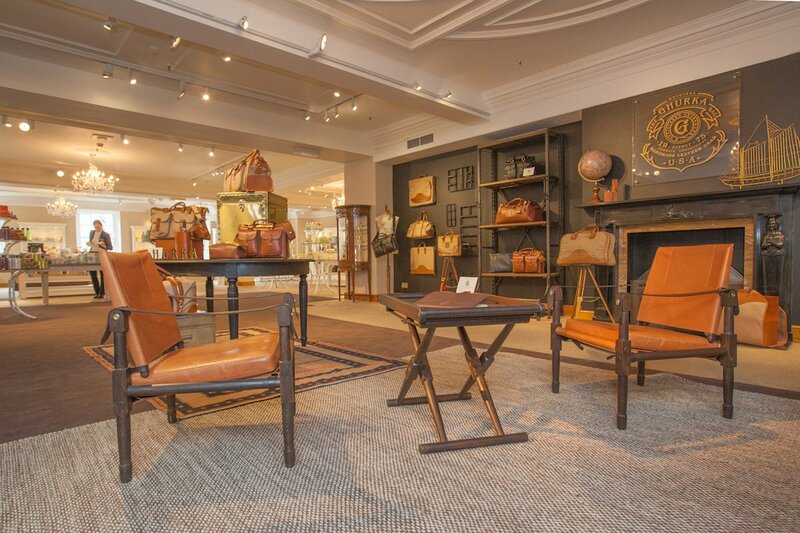 American leather-goods brand Ghurka has just launched in London, with a nicely done space at Fortnum & Mason. I’ll post more detail on Ghurka, its make and quality, at a later date when I’ve used the product first-hand. But for the moment it’s worth reporting one or two interesting points from the press lunch earlier in the week. 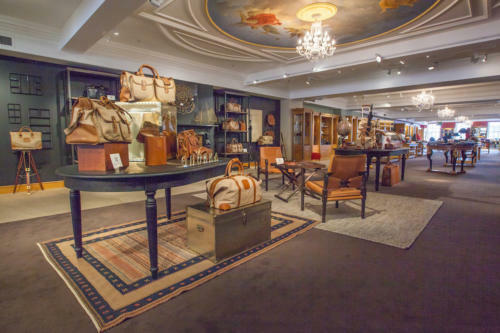 Ghurka was started in 1975 by an American called Marley Hodgson, when he bid for (but lost on) a set of luggage belonging to a gurkha officer at an auction in England. The brand he created deliberately changed the spelling of the name to avoid confusion with the gurkhas – Nepalese soldiers. This could seem like it is trading on the name of the soldiers rather, except that Ghurka has involved them with the UK launch, and an enthusiastic representative from the Gurkha Welfare Trust was at the lunch. The set-up at Fortnums includes quite a few archive pieces, which is a good sign, as these have clearly been heavily used and worn – and ridden it out well. There is also a repairs service at the factory in Connecticut, although it is not free (unlike Filson). The aesthetic is similar to Filson – canvas, leather, brass hardware, very practical – but not quite as rugged (softer, non-bridle leather) and made to a higher standard. There is also a general proclivity for leather-bound edges. Although it’s not my favourite style, our own Bruce Boyer is also a fan. For anyone visiting London, by the way, Fortnum & Mason is worth a visit. The selection of men’s accessory and perfumes tends to include slightly more unusual brands, but given good space and a full range. There are also plans underway to expand the offering – and it compares well with the mania of Selfridge’s or Harrod’s. Pictured with the lovely Pam Bristow of Ghurka. 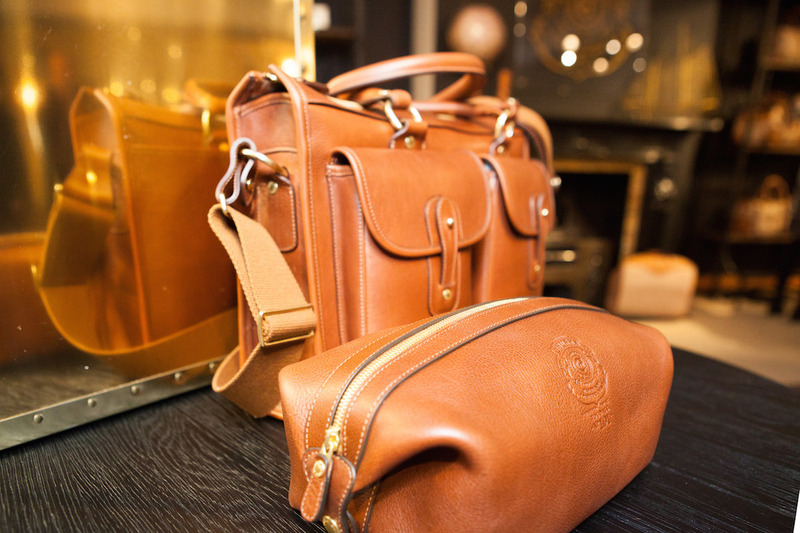 You can follow the discussion on Ghurka luggage launches in the UK by entering your email address in the box below. You will then receive an email every time a new comment is added. These will also contain a link to a page where you can stop the alerts, and remove all of your related data from the site. Which is the difference between bridle leather and just leather (no saffiano or grain)? What do you recommend as for a wekender? I’m looking for a well-made leather pocket protector to carry pens in my inside coat pockets without excessive wear. Have you seen such a thing? Do you know someone who would make it? I think many gents must have this need, but have searched and searched and can’t find a good one. I greatly appreciate your insights and advice. I’d imagine it’s quite unusual – most men don’t carry that many pens these days, and if they do they’d have them in a bag. Of course many just clip them onto the inside pocket too. 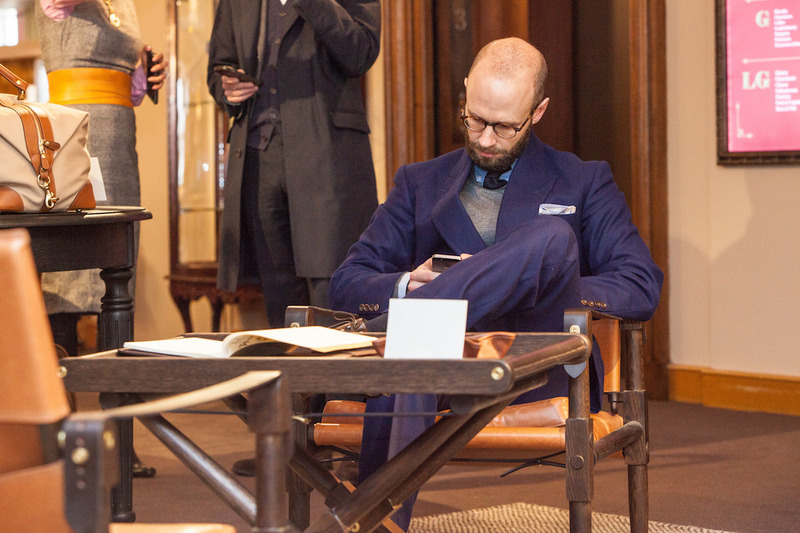 Any bespoke maker (eg Dunhill in London) would do it for you, though it wouldn’t be cheap. If you want something simple speak to Jonatan at M.E.S. leather. Just a question on your suit – is that French navy from Fox? button-down shirt with DB suit ? Very daring! Thanks for this update, I checked out Ghurka after the Bruce Boyer article – good to see that they have a space in London. On the subject of bags I came across La Portegna in Marylebone the other day, beautiful leathergoods from artisnal workshops in Spain, thought you might be interested. On another matter… would it be possible to get your views on the issue of updating suits. For example I have a number of suits bought a decade ago, which now look out of date (especially the trousers – cut loose and wide). Is it better to alter (bearing in mind that it still has to match an older cut of suit coat) or wait for the fashion circle to turn. Where are these made, India? China? I like both the full leather and canvas and leather styles but am on a budget of around £200-£300. It would be used frequently so quality and durability are my main concerns. 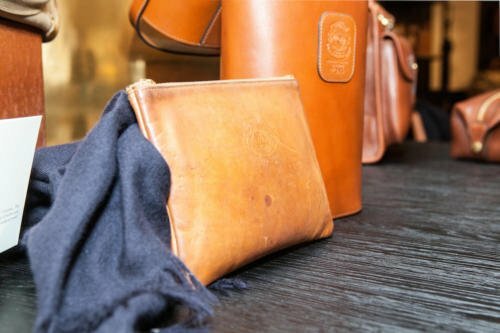 what do you think of buffalo leather as this seems to be a common choice at this price range ? and could you suggest any brands worth considering ? Have you had a look at Filson? is canvas durable enough, and would it stain if it got wet ? I travel frequently and the bag will receive a good deal of abuse, hence my question about buffalo leather ? I travel 80% of the year and haven’t found a stylish yet durable roller bag. I own a Bennett Winch Suit Carrier, but would like a roller bag as well. Any suggestions? Hi Simon, any thoughts specifically on the higher end (see Garrison, Express, Counselor, and Examiner models) briefcases offered by Ghurka? I’m not a fan of the Ghurka twill bags or the bizarre camouflage bags with stripes but I came across the Garrison No. 147 briefcase recently and it’s pretty stunning. 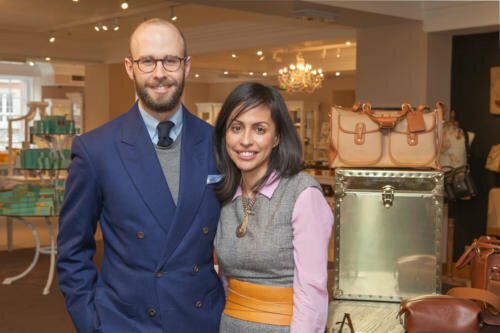 I’m considering purchasing a Ghurka Garrison or a Frank Clegg zip-top briefcase at the moment and I’m trying to figure out why Frank Clegg bags get so much love online while respect for Ghurka bags seems to be reserved for their vintage pieces. The Garrison seems a bit more robust (e.g. brass inserts to protect the bottom seams of the bag) than the FC bags but obviously the FC bags have cleaner designs. I may be wrong, but the craftsmanship on the Ghurka bags seems to be a least on par with the FC bags but maybe I’m missing something. Interested in hearing your thoughts. Thanks again! From a quality point of view they’re fairly similar but Clegg is rather better value for money.